Coagulation, also known as clotting, is the process by which blood changes from a liquid to a gel, forming a blood clot. 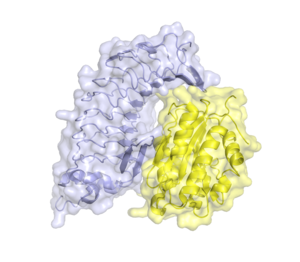 It potentially results in hemostasis, the cessation of blood loss from a damaged vessel, followed by repair. 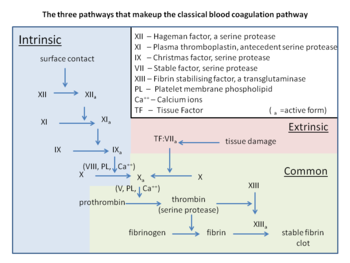 The mechanism of coagulation involves activation, adhesion and aggregation of platelets along with deposition and maturation of fibrin. Disorders of coagulation are disease states which can result in bleeding (hemorrhage or bruising) or obstructive clotting (thrombosis). Coagulation begins almost instantly after an injury to the blood vessel has damaged the endothelium lining the blood vessel. Exposure of blood to the subendothelial space initiates two processes: changes in platelets, and the exposure of subendothelial tissue factor to plasma Factor VII, which ultimately leads to fibrin formation. Platelets immediately form a plug at the site of injury; this is called primary hemostasis. 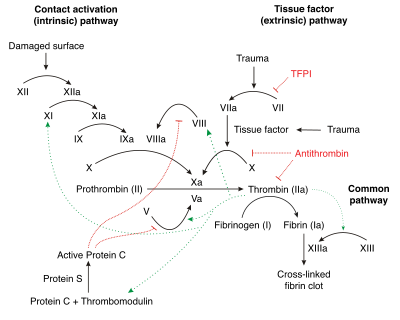 Secondary hemostasis occurs simultaneously: additional coagulation (clotting) factors beyond Factor VII (listed below) respond in a complex cascade to form fibrin strands, which strengthen the platelet plug.